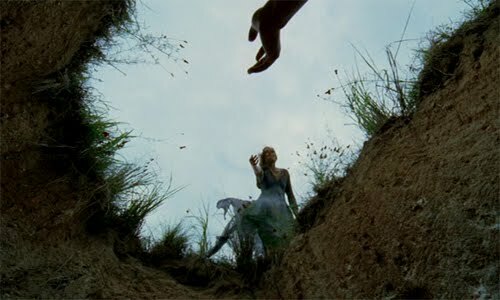 Terrence Malick's means of communication -- both visually and tonally -- often relies on the underlying power of the periphery beauty surrounding the stories he tells. Rolling wheat fields in Days of Heaven reflect on the splendor of America's agricultural cornerstone in the early 1900s, while serving as a lingering precursor for events to come. The New World divides its focuses among the gloriousness of season- changing, from falling leaves and rushing brooks to the starving severity of snow, as it tells the familiar story of the war (both internal and external) among Native Americans and settlers. So, what happens when Malick takes on the full breadth of life itself? Something grand and flooring is expected from The Tree of Life: a symphonic poem that'll rock the soul with its artistic allure while saying plenty about its subject matter. But even as Malick accomplishes this, the span of his vision proves too sprawling, rendering his latest into a stunning, abstract, yet imprecise and scattered work of allegorical beauty. With his signature perspective-shifting narration and sweeping aesthetic focus in tow, the magic and mystery of life's trickle-down effect becomes the root structure underneath Malick's non-linear challenge, where he aims to juxtapose the genesis of existence as we know it -- or, at least, as it's theorized on a scientific level -- against a portrait of '50s domesticity. Grand images of swirling nebulous (biological, lava-based, water-based) and, yes, several full-bodied (computer-generated) dinosaurs occupy the film's earlier moments, following shortly after images of a family grieving an unknown calamity. 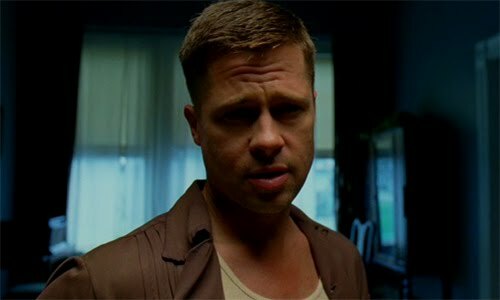 After we've seen the creation of life on a broad scale, we're shown another version of the creation of life on more intimate terms: the growth, development, and contorted maturation of three brothers under the parentage of a delicate mother (Jessica Chastain) and a loving but stern bread-winner father (Brad Pitt). Malick also interjects modern-era images of a man (Sean Penn) going about his own version of a domestic life and, intermittently, walking through canyon passages, while reminiscing on these past images -- memories? -- playing before us. Everything centered on the family dynamic is powerful, breathtakingly so, in a way only Malick can orchestrate. Slight facial nuance and instinctive camera movement through rustic Americana remains an evocative playground for the director, where he follows the family's ebbing and flowing, during affectionate times and volatile, with a concise eye for the emotional spectrum. Memories of childhood, fatherly conversations, and the simple scene of boys sprinting on a dirt road possess an emotional clarity that's purely his doing, mostly centering on the eldest son Jack and how the firm hand of his growingly-terse father -- and the weak hand of his mother -- alters his composure in regards to obedience and destructive tendencies. In essence, his morphing outlook becomes a portrait within a portrait, where one can see flickers of Malick's own Badlands in the shrewd slow-boil of destructive tension and rebellion as aftereffects. Taken on its own terms and considering the astute performances, especially from a warm, stony, then menacing Brad Pitt and the disarming moral compass-spinning of newcomer Hunter McCracken as Jack, the heart of the film strikes a deft chord as it captures the passing of temperament from parents to children. But that's not the sole point to The Tree of Life, which harbors a much more complex motivation. 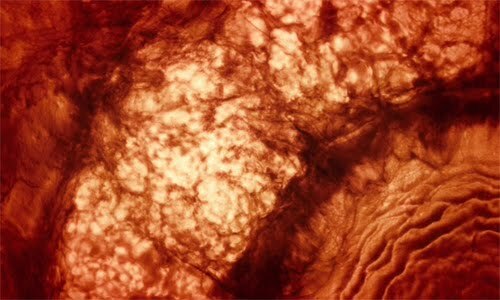 Malick also throws his full creative hand on the table by constructing his view-from-the-top perception of life's enduring essence, which renders images of time and space that hearken to both the free-form imagery of Stan Brakhage to the formalistic steadiness of Stanley Kubrick, all within the boundaries of the director's own cinematic meter. I understand the point that Malick attempts to arrive at -- or, at least, how I interpret what he's after -- by juxtaposing the two versions of life's development against each other. He's illustrating the gradient of growing pains in both biological and emotional forms (and, at times, one in the same), connecting the similarities of nature-dictated development spanning across time in terms of environmental shaping. And he concurrently, and daringly, dabbles in contemplations of higher-being faith, fear, and the inherent differences amongst people in the process. There's a lot going on, and it's mesmerizing in a quasi-meta sort of way. The components of The Tree of Life, however, don't cohesively snap together as a whole, the all-embracing perspective spread out like a net cast too far and wide without catching a unified viewpoint. Some will look at the non-linear abstractness of bubbling primitive creation paired against wispy, dramatic Americana and revel in the mysterious and imaginative expression resonating in its divided parts. It's clear, though, that Malick has attempted to assemble a montage with a firmer overlying message than segmented impressions, yet the connecting-of-dots occurs in a way that isn't readily apparent -- and, even after further introspection, still isn't. He overextends his avant-garde sensibilities, from the too-lengthy churning cosmos that separates the past from the present to the clumsy usage of Sean Penn's place in the narrative as an older iteration of Jack, and by the end the big picture left me more exhausted than enthralled by Malick's enigmatic contemplations. Considering that his films are already deliberate in pacing, focus, and visual manner, stretching his topic wider in this way without clearer concentration waters down its poignancy. It's graspable, or at least parts of it, but the cinematic reward for doing so doesn't balance against the effort it demands. While trying to figure The Tree of Life out, and depending on the level of investment that the viewer places into the film, its beauty and clandestine magnetism still casts a spell through its expressiveness, and the time passes somewhat effortlessly because of it. Aesthetically, it's beyond what's expected; the cinematography from Children of Men photographer Emmanuel Lubezki astounds with its graceful flow through '50s Texas (and elsewhere), while the elegantly-handled mix of familiar and original scoring from Alexandre Desplat creates a sweeping aural experience that marries the visual's tone flawlessly. This orchestration of sonic and dramatic potency might provoke thought inside what Malick has judiciously pieced together, due purely to his cinematic style, or it might infuriate with its scope -- or, like with me, it might do a bit of both at the same time. There's no denying his captivating vision, though, and that's to be celebrated even in the wake of strewn realization, where a great 110-minute work of art strains within 135+ minutes of entrancing overexertion.